A crucial factor of a successful eCommerce site is creating trust between your company and your customers. They need to trust that your products or services will meet their needs and standards, and they need to trust you with their sensitive payment information. In order to establish that trust, eCommerce organizations need to comply with the Payment Card Industry Data Security Standard (PCI DSS), a 12-part roadmap to creating a secure payment process on your site. The PCI DSS is a global standard for payment security for retailers, online merchants, credit data processors, and other payment-related businesses. PCI compliance is not an option for eCommerce sites; it’s a necessity. 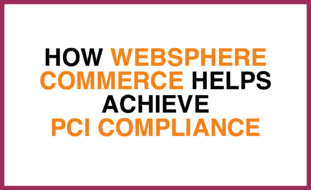 We have already touched on how Magento helps to achieve PCI Compliance, but what about WebSphere Commerce? WebSphere Commerce offers a guide to ensuring that your WebSphere Commerce Payments subsystem is PCI compliant, but if you are using one of the other options, it is entirely up to your team to determine if the payment process is PCI compliant or not. Additionally, WCS provides a list of configuration actions that are required to ensure that your WebSphere Commerce implementation is PCI compliant. While properly utilizing WCS puts you on the path to PCI Compliance, these actions are required to achieve it. The actions address requirements 1, 3, 4, 6, and 10 of the PCI DSS. Read more about these configuration actions here. To stay up to date on security fixes, WebSphere Commerce recommends subscribing to the WebSphere Commerce Security Bulletins, which will update you on recommended security fixes as needed. These recommendations are just the tip of the iceberg when it comes to PCI Compliance and WCS. For more thorough information, be sure to work with an informed consulting partner, and check out the IBM Knowledge Center. Have a question about WebSphere Commerce and PCI Compliance? Contact our team of WCS developers.